This book is designed to demonstrate to every investor who reads it that they MUST include real estate as an essential part of their investment portfolio. The reader will be assured as to why this is an essential component for a long term retirement income stream. “DON’T PAY THE BANK…BE THE BANK” The text will educate it’s reader as to why Wall Street is designed for Wall Street and not the average investor. You will learn why real estate is the number one way the average american becomes a millionaire and how to duplicate this attainable success.”WALL STREET’S SHEEPLE PLAN” You will be amazed by the powerful yet simplistic time proven investment strategies that you will learn in this book. “KINGS NEVER HAD MORTGAGES” Lastly and most importantly the desire of the author is that you will share this education will all your friends and family. 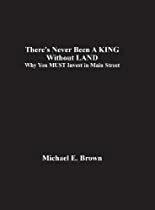 It will be especially important to educate your children so that on the day they inherit your LAND and they will know how to rule over it.”THERE’S NEVER BEEN A KING WITHOUT LAND” The author Michael E. Brown has been in the real estate business since 1996. He has been a full time real estate investor since 2000. Along with his investment business he has owned and operated both a mortgage company and real estate brokerage. He currently spends his time investing in distressed properties while consulting and advising other on how to do the same. He has never seen a better time to invest for those who know what they are doing.